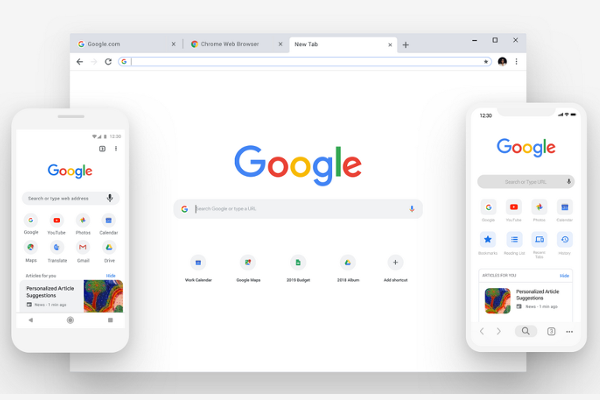 Google Chrome update brings new features to Android, iOS, Linux, macOS and Windows. First up, Chrome has a new look. You can see it across all platforms-desktop, Android, and iOS-where you'll notice more rounded shapes, new icons and a new color palette. On mobile, Google made a number of changes to help you browse faster, including moving the toolbar to the bottom on iOS, so it's easy to reach. You can now create and manage shortcuts to your favorite websites directly from the new tab page-simply open a new tab and "Add shortcut." And you can now also customize the background of a newly-opened tab with a photo. Google also significantly improved the way Chrome handles passwords. When it's time to create a new password, Chrome will now generate one for you. Chrome will save it, and next time you sign in, it'll be there, on both your laptop and phone. Google changed the shape of tabs so that the website icons are easier to see, which makes it easier to navigate across lots of tabs. The smart search bar will now show you answers directly in the address bar without having to open a new tab-from rich results on public figures or sporting events, to instant answers like the local weather via weather.com or a translation of a forei word.